This work was first produced at Rome in January 1900. The libretto is an adaptation of Sardous famous tragedy. The date is 1800, and the main facts are said to have a historical basis. The story centres round the doings of Scarpia, the chief of the police in Rome, himself the perpetrator of worse crimes than those he has officially to deal with. 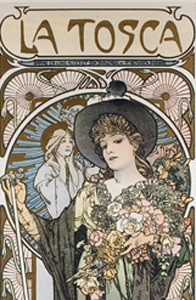 This 1900 poster (designed by Alphonse Mucha) is for Victorien Sardou's play La Tosca, and depicts Sarah Bernhardt in the title role. Puccini's opera, La Tosca, was inspired by this play. Mario Cavaradossi, an artist at work in a church, encounters Angelotti, a friend and an escaped prisoner seeking sanctuary. Mario befriends him, helping him away in the disguise of a woman. Floria Tosca, Marios fiancée, and a famous singer, suspects Mario of a flirtation, and the suspicion is fostered by Scarpia, who is able to show her a fan dropped by Angelotti in his flight. In the second Act, Scarpia arrests the artist for complicity in Angelottis escape, and Mario is being tortured in a room beside that in which Scarpia sees Tosca, for whom he has conceived a violent passion. In her mental distress Tosca tells the whereabouts of Angelotti, and the torture of Mario ceases. Scarpia now presses Tosca to yield her honour, and at the price of Marios life she consents, but suddenly murders Scarpia with a carving-knife and escapes. After a scene between Tosca and her lover in the prison, Scarpias treachery is revealed; for Mario, in spite of Scarpias promise to order blank cartridge, is really shot, and the preconcerted plan by which he was to feign death and then escape comes to naught. Whereupon Tosca throws herself from the parapet into the Tiber. The music shows the hand that wrote "La Bohème"; but, at the same time, as a critic pointed out after the first London performance in July 1900, it is more closely akin to the work of Mascagni and Leoncavallo than the earlier and lighter opera. It has the same merits and the same defects. The chief merit is the sense of impulsive passionate life which it conveys; the chief defects are lack of strong, broad melody and of anything like development, and crudity in the obtaining of effects. The orchestration is clever, but thin in texture wherever it is not blaring and blatant. There is but little attempt at polyphony in the ordinary sense, though there are some big ensembles where several ideas are presented to us at once; but they go on independently rather than combine into a homogeneous whole. Such is the Finale of the first Act. Another weakness of Puccinis music is a certain lack of aptness in musical characterisation, though the music accompanying the entrance of the old Sacristan is an exception proving the rule. The leading motives, which are employed freely, are not in any sense treated -- simply repeated. But with all its faults there is much sincerity in the music, and such strength of utterance that it has the power of holding the hearers attention and adds to the poignancy of the drama. 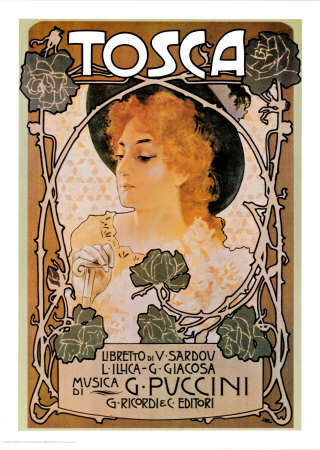 The cover of the music and libretto of Puccini's opera, La Tosca, published in 1900 and reproduced here as a beautiful poster.